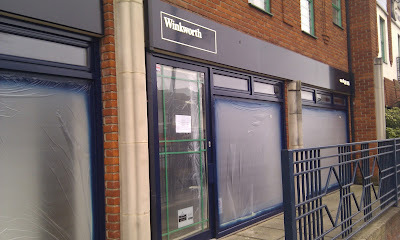 The WORCESTER PARK Blog :: Where's Winkworths? Yesterday, I reported the mild confusion caused by Winkworth's Estate Agents PR team who had taken to Twitter to trumpet the opening of the Worcester Park Branch despite it appearing not to have opened yet. Fortunately this did not lead to widespread panic on the streets and looting , but it could easily have done. Being the kind blogger that I am, I tweeted @WinkworthPR to seek clarification. When I regained consciousness, I found that @shaunamner had tweeted me to explain that '"Technically" the branch is trading & WP properties being handled via Cheam office." Which seemed a bit like saying that technically Tesco is trading in Worcester Park, but all sales are being handled by their New Malden megastore. To be fair, Shaun and his team have been trading as Bairstow Eves in the same premises for the last 10 years and have only just joined the Winkworths group, so they are still handling Worcester Park properties (albeit from their Cheam office until the refurb of the Central Road office is finished). I think I finally understand. Welcome to Worcester Park, Winkworths!